Grace, peace, and mercy to you from God the Father, and from our Lord and Savior, Jesus Christ, through the Holy Spirit. Amen. The Denial of St. Peter by Gerard Seghers, c. 1620-1625 (public domain). Where once Peter denied even knowing Jesus (as depicted in the painting above), in Acts 5, Peter loudly proclaims Him in front of the Jewish authorities. Last week I was sickened, I was enraged, and my heart was broken. Have you heard about Alfie Evans? Alfie Evans was a 23-month-old boy living in England. After six months of fighting a terminal brain condition, he was taken off of the ventilator that was helping him to breathe. Not by will or desire of his parents, but by the decision of the hospital and enforced by court order. The doctors told the family he would only last 3 minutes off the ventilator. This was Monday morning. He was called home by our Lord on Saturday, five days later. 44 hours after taking him off the ventilator (the time of the original writing), Alfie was still breathing ON HIS OWN. Yet, the hospital refused to give him oxygen. Not only that, but they refused to give him food and water because they were determined to have Alfie die. And, the courts upheld the doctors’ decision over the wish and will of Alfie's parents. Amplifying this tragedy, the courts also denied Alfie to fly to Italy for further treatment. The Pope himself had requested that the Italian military fly the child free of cost to the largest and best children’s hospital in Europe which is in Rome. The Italian military immediately sent a medical helicopter and had it on standby. The hospital in Rome had already publicly said they would treat Alfie for free. The reasoning of the courts? They agreed with the doctors in England that it was in Alfie’s “best interest” to die. How far has the medical profession come to have reversed these values? At one point on Wednesday, after the ruling of the British appellate court, a German medical helicopter crew was forcibly removed from the hospital by British police. Even a country with nothing to gain was willing to fly Alfie to a place where doctors and nurses were willing to fight with every ounce of strength on Alfie’s behalf until he died naturally. But, apparently what us ignoramuses in the rest of the world were not getting through our thick skulls was that it was in 23-months-old Alfie’s “best interest” to die. The parents were wrong. Religious leaders were wrong. Other doctors were wrong. Other countries were wrong. We were all wrong! Because the British appellate court said we were. The language I want to use to describe this perverse abortion of justice is not church appropriate, so I am afraid I must stop. And, here’s the thing. I am not a dumb person. I know that the medical staff at the hospital agonized over this decision. I know that the doctors and nurses that treated Alfie will take an inexpressible grief to their graves over this. I know that they did not come to this decision lightly and that they truly believe that they are doing the right thing for Alfie. But, I also know with every fiber of my being that the decision they made was wrong and that wrong decision was compounded by the courts enforcing a death penalty on an innocent 23-month-old. Alfie was going to die, his condition was irreversible. But he did not need to die like he did! The parents should not have been forced to watch their son die prematurely because a doctor said so! I am enraged. I think many of you are, too. This is abhorrent. It is a fetishization that somehow death is better than life. If I took one of my dogs to the vet because it was sick, and the vet told me it would be better to put the dog down and I told the vet, “No. Do whatever you have to, including life support.” You know what my vet would do? What I directed. The vet would not get a court injunction forcing me to put down my dog because to do everything humanly possible would be animal cruelty. Even though the vet disagreed with my decision, he would follow my directive. The doctors and courts have decided that Alfie’s parents have less rights than a dog owner when it comes to their son. Where are the doctors, nurses, hospital administrators, and judges who declare, “We must obey God rather than men?” Isn’t that what we would each hope to say? “Who are these doctors and judges that deem it good, right, and salutary to take the life of a 23-month-old little boy desperately fighting for a chance at life?" You. They are you. Nor am I innocent as well. Let me ask you some questions. Have you unjustly taken the life of anyone, born or unborn? Do you treat your body as a temple of the Holy Spirit, or do you hurt or harm it by gluttony, chemical addiction, or other abuse? Do you hate anyone, or are you angry with anyone? Do you lose your temper or injure your neighbor (or family) by thoughts, words, or deeds? Do you hold grudges or harbor resentment? Do you ignore the plight of the helpless, or are you callous toward genuine need? 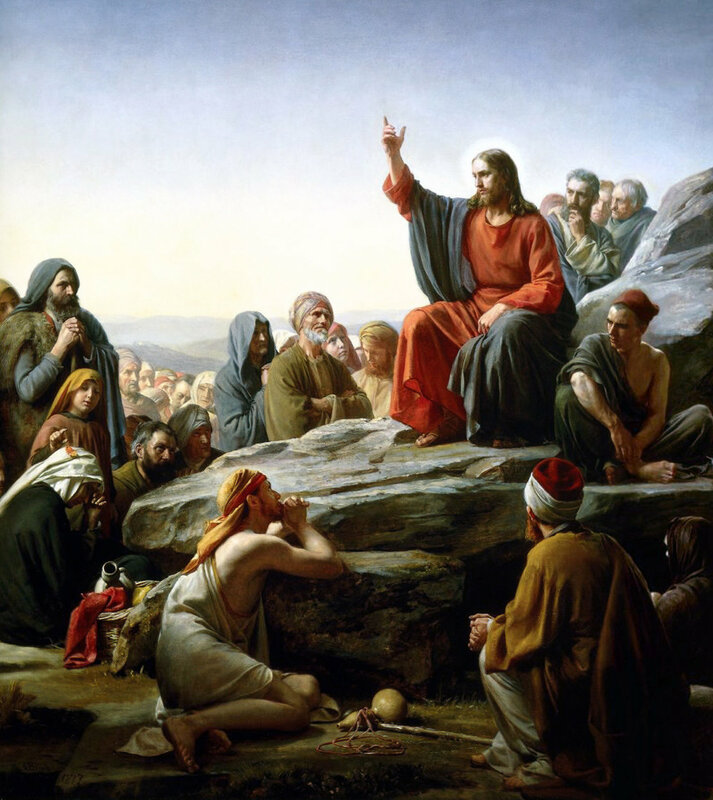 The Sermon on the Mount by Carl Bloch, 1844 (public domain). We are guilty, horribly so. Yet, God tells us that “if we confess our sins, He is faithful and just to forgive us our sins and to cleanse us from all unrighteousness” (1 John 1:9). To paraphrase Peter a bit, the God of our fathers raised Jesus, whom we killed by our sin. God exalted Him at His right hand as Leader and Savior, to give repentance to Israel and forgiveness of sins. And we are witnesses to these things, and so is the Holy Spirit, whom God has given to those who obey Him. Sometimes when we confess that we are poor, miserable, wretched sinners I think we forget what we are actually saying. We are saying that we are idolaters. That we swear and that we curse, even in the name of God. We are confessing that we hate God’s word. We despise those in authority over us. We are murders, adulterers, and thieves. We are liars and covetousness. And, through all these things we murdered Jesus Christ, the Son of God. Even so, God has exalted Him as Savior, to give repentance and forgiveness of sins. The mercy seat of God is no longer the Ark of the Covenant, like in the Old Testament. But, it is now the person of Jesus Christ, our God and Lord, who made the new covenant by shedding His blood for the forgiveness of sins. In the Old Testament, when God confronts King David through the prophet Nathan for the horrible sin David committed, David realizes his wrong. David said to Nathan, “I have sinned against the Lord.” And Nathan said to David, “The Lord also has put away your sin; you shall not die" (2 Samuel 12:13). So, too, in Christ has God put away your sin. Through our faith, given to us in Baptism, we are forgiven because of the work that Christ performed on the cross. In Christ we have hope for salvation. And there is salvation in no one else, for there is no other name under heaven given among men by which we must be saved (Acts 4:12). In Jesus Christ does the richness of God swell and wash over us. A tide that makes us clean. Jesus Christ blots out the pungent stain of our hideous sin and makes us pure, purer than snow. No longer are you under the penalty of sin, but we are covered in the perfect righteousness of Christ. In the love of God, Jesus looks at us and says, “I do not condemn you; go, and from now on sin no more” (John 8). May He grant that it may be so. Amen.